Cempaka's annual ThinkCon event came to a spectacular end this evening, thus bringing a close to the number of points being tallied for the First House Cup. Cempakans swarmed the concourse area of Bangsar Village I from 10.30am to 7.00pm, in anticipation of exercising their brains after the long Raya break. Minds were challenged and strenuous decisions were made. 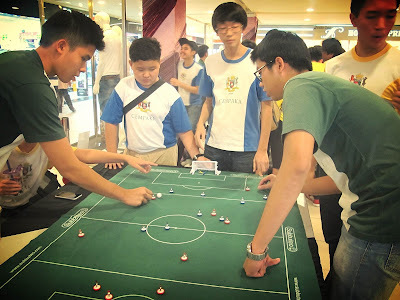 Cempakans fought long and hard, pitting their strategies and tactics in a battle of wits to best their opponent. You'd think the large crowd was gathering for a football match, or maybe even a debate competition. Though in fact, it was all in the name of a few board games. Not just any mere board game however. 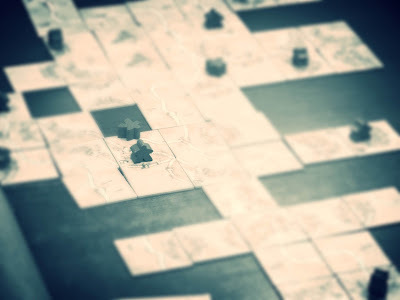 Like its name suggests, ThinkCon consisted of board games specifically designed to put your thinking skills to the test and challenge your mind. Stay with us to see what went on during the sidelines of the intense table soccer matches- mind-blowing penalties, fatal fouls and all! Get the down low on the strategic maneuvers and twists during Settlers of Catan and Carcassone matches. Discover the inspiration behind the spectacular showcase of A New Kind of Hero - design and story to superhero-dom all in courtesy of the highly-creative teams from the Cempakan houses. Keep up-to-date with us to find out the results of this action-packed day filled with spirited cheers, intense situations and some really close games! good the day, aim to use all-natural window light to illuminate your subjects. Wedding Photographers in Bangalore where the brides's gown and also face appears over-exposed. best. good to download it once more as you've downloaded it in the iaptoideapkdownload.com the ability to set up the application once more. nice. good I think that today we have actually covered everything Vidmate for Android your favorite TELEVISION Serial or your Favorite Movie nice. Great downloaded and install Kodi APK documents and Kodi Download Media Center, is a prize-winning cost-free and Fine. YJC Writer in the NST!